Every year, bloggers, business forums and social media starts to buzz with the year’s top books for small business. From the best beach reads as seen on Wired to the best books for small business owners from the Huffington Post, there is a little something for everyone. As we head into the dog days of summer we have to admit that it has been more than a little hectic here at Seafoam Media. Between our passion for all things SEO and our recent foray into art with a very large bowling pin; finding time to read can be hard. These lists spurred a conversation in our office the other day. Given our wildly different personalities, we wanted to see what books had made an impression on some of the Seafoam Media team over the years. Some are older books and some are new, but all of these books have shifted the way we at Seafoam operate from day to day. So, without further ado, we offer Seafoam Media’s Best Business Books. Our fearless leader, Nikki Bisel, offers this suggestion: I love “Scaling Up” by Vern Harnish. The book, originally released as “Mastering the Rockefeller Habits”, offers practical advise for building a scalable and sustainable business. The core tenets of the book looks at the four major decision areas that any company must master in order to succeed; people, strategy, execution and cash. What makes this book so amazing is that it helps business leaders enjoy the entrepreneurial ride by helping them get their “business machine” running. It has helped me create a company in which my employees are engaged and energized. It also helps me ensure my customers are my best form of marketing because they are so happy with our work. I recommend this book to any business owner, regardless of size or industry. The team’s project manager, Erik Schwenke, offered this book as one of his favorites: I discovered the book, “Jab, Jab, Jab. 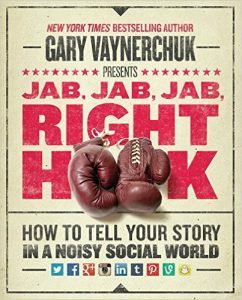 Right Hook” by Gary Vaynerchuk in a completely random way. I won it through a contest held by a podcast. What could have been just a random prize ended up being a real windfall for me because it is such a great book. It looks at two strategies for social media. It shows the jab approach, which is consistently and patiently engaging with customers online; building relationships. It also looks at the right hook, which is a knock-out punch that will take down your competition. When you master both it will help you float like a butterfly and sting like a bee, socially speaking. Liz Oeltjen, Seafoam’s marketing strategist had trouble narrowing down her list. I have read several of Jim Collins’ books, including “Good To Great” and “Great By Choice.” All have shifted the way that I look business from both a strategic level and a personal level. The one that I think had the most impact would be “Built To Last” by Collins. In it he looks at companies that have succeeded over time compared to others, in similar industries, that have failed. One of the most compelling parts of the book offers the concept of BHAGs, or Big Hairy Audacious Goals. It reminds me that we must have a clearly defined goal, a shining finish line, that we shoot for in everything we do. Of course this is just a small sampling of the best business books that have shaped the team at Seafoam Media. Stay tuned for our next blog post as we explore more of the team’s favorites books. Or, find us on Facebook or Linkedin and share your favorite business books on our page to join in the conversation.